RiduZone is an FDA acknowledged new dietary supplement of OEA (Oleoylethanolamide) to support a healthy appetite, weight, and body fat composition. As nature’s appetite and weight regulator, RiduZone is the perfect daily supplement to support your healthy weight goals. Q: What is OEA (Oleoylethanolamide)? OEA is a highly concentrated metabolite of olive oil. RiduZone was designed to harness the benefits of mediterranean food and to help support weight management. RiduZone (OEA Capsule) is accepted by the FDA as a new dietary supplement. OEA is a natural regulator of appetite, weight and cholesterol. OEA is a natural metabolite that is made in small amounts in your small intestine. OEA helps regulate hunger, weight, body fat and cholesterol by binding to a receptor known as PPAR-Alpha (Peroxisome proliferator-activated receptor alpha). In essence, OEA increases the metabolism of body fat and tells your brain that you are full and it’s time to stop eating. OEA is also known to increase non-exercise related calorie expenditure. Q: Is the OEA in RiduZone Natural? While OEA is a naturally occurring metabolite produced in the body, the OEA in RiduZone is a New Dietary Ingredient produced by an FDA (Food & Drug Administration) acknowledged chemical method. Q: What is HEART (Healthy Eating & Activity with RiduZone for Transformation)? 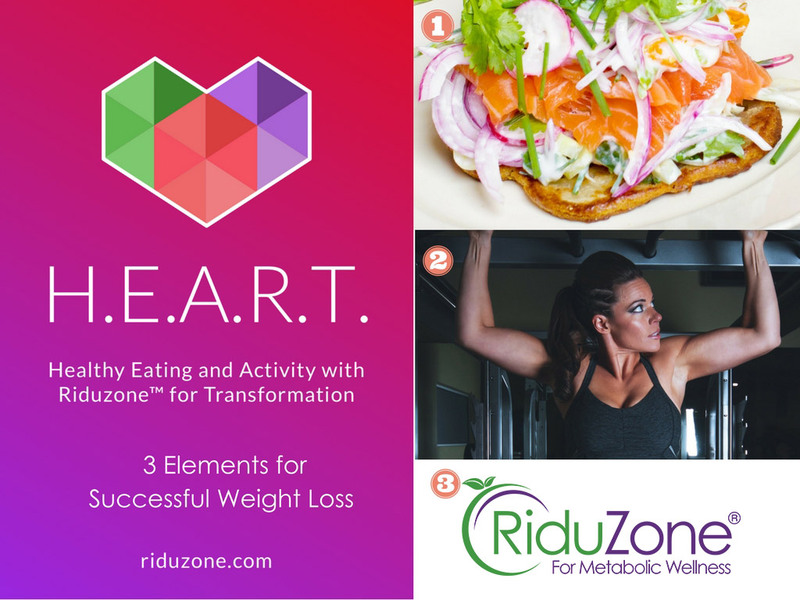 HEART (Healthy Eating and Activity with RiduZone for Transformation) is a 3-month, scientifically developed, metabolic wellness program to assist our customers with their weight loss goals. 2) HEART App (free with purchase of RiduZone) to determine customer's desired calorie intake to achieve desired weight goals, plan meals, and track their exercise & calorie burned. HEART App syncs with fitbit and other tracking devices. 3) Nutrition, exercise and fitness coaching: Online support is free with purchase of RiduZone; Tele-support available for additional fee. This helps customers on the 3 month program to understand how to achieve their weight loss goals. Q: Why is Healthy Weight Important? Q: What makes RiduZone Unique? OEA has been studied and documented as a natural regulator our body already creates. Q: What is the science behind OEA? RiduZone® is the only FDA Acknowledged product in the market with the patented dietary ingredient oleoylethanolamide (OEA). Our team wants to provide you a supplement that is backed by years of science. Food intake is inhibited by oral oleoylethanolamide., Nielsen and others. Oleic acid content of a meal promotes oleoylethanolamide response and reduces subsequent energy intake in humans., Mennella and others. Modulation of plasma N -acylethanolamine levels and physiological parameters by dietary fatty acid composition in humans., Peter Jones and others. Q: What does FDA Accepted New Dietary Ingredient mean to me? Did you know the FDA does not approve dietary supplements? Unlike new drugs, dietary supplements are not reviewed and approved by the FDA based on safety and effectiveness. The RiduZone team, however, submitted RiduZone to the FDA as a New Dietary Ingredient (NDI). It was important for us to get the acceptance of the FDA because we wanted this trusted organization to review the science of RiduZone (and it’s primary ingredient OEA). ) In the Summer of 2015, NutriForward, LLC received the acknowledgement of RiduZone as a NDI from the FDA. A New Dietary Ingredient acknowledgement from the FDA means that we can market RiduZone as a supplement that is safe under the suggested use. Q: Where is RiduZone made? RiduZone is made in U.S.A with domestic & imported materials.